The Ontario Heritage Trust – the province's lead heritage agency – is dedicated to identifying, protecting, renewing and promoting Ontario's rich and diverse built, cultural and natural heritage that has influenced and continues to shape our society for the benefit of present and future generations. his application is for "Doors Open Ontario 2014". 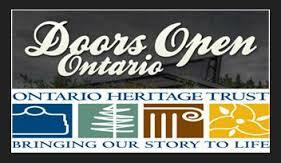 The Trust has set the stage for continued program growth by integrating Doors Open Ontario into the Trust’s new 5-year Interpretive Plan. The interpretive theme for 2014 will be the First World War with a focus on the influence on provincial identity and transition to modern life and society. In 2014, the Trust will implement a carefully thought out growth plan, targeting identified new communities. It is estimated that over 1,300 sites in 276 separate communities (up from 260 in 2011) will take part, meaning that more than 92% of Ontario residents live within an hour’s drive of a Doors Open Ontario event. New targeted communities for 2014 are Essex County, North Wellington, West Nipissing, West Elgin, Saugeen Shores, Elliot Lake, Kirkland Lake , and Fort Frances, as well as in returning communities of Peterborough, Sault Ste Marie, North Bay and Scugog. The number of sites per event has been increasing as communities are increasingly joining forces to form larger, regional events. This collaboration often includes multiple levels of municipal government (combining lower-tier, single-tier and upper-tier—or regional—municipalities). Despite a diminishing stock of “new” communities to draw from, the Trust has been able to have new sites opening their doors for events each year.